We know you're itching for more Helio Ocean coverage, so here it is: a live Sizemodo of the Helio Ocean vs. every phone we have. First, we'll kick it off with a similar type of device: the slide-out QWERTY smartphone. 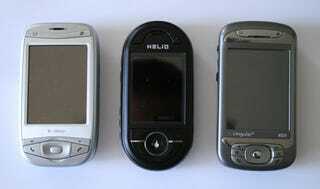 In the middle we have the Helio Ocean, on the left there's the T-Mobile MDA, and on the right is the Cingular 8525. Which is bigger? Check the gallery to find out. Update: We've got three more galleries for you now, the most exciting of which is the Ocean vs. LG Prada and iPhone (papercraft). Even though it's not quite in the same category, you guys (in the poll held yesterday) decided that you were looking forward to the Ocean even more than the iPhone. Here they are, head to head. Make the jump for the Ocean vs. QWERTY phones like the SideKick 3, the Moto Q, Palm 755p, and various other Helio phones.